On 12 July, we have finalized the first residential capacity-building training course of the No Hate Speech Movement Albania “Power of words” that was implemented by the team of the Youth Center “Perspektiva” and NGO “Projekte Vullnetare Nderkombetare” with the financial support of the Council of Europe and institutional – from the Albanian Ministry of Social Welfare and Youth. A group of young people from Albania and Kosovo gathered for a week in Durres to learn about the scope and forms of hate speech online and offline in Albania and Kosovo, explore the target groups and possible counter-arguments and, in the end, how to change the situation for better through youth activism and community work. The opening of the training course was organized in the Albanian Ministry of Social Welfare and Youth, where the participants were welcomed by the Project Team and Jehona Roka – National Campaign Coordinator of the No Hate Speech Movement Albania. The opening session created the floor for an interesting discussion of the participants with representatives of the leading international institutions in Albania, such as Marco Leidekker, Head of the Council of Europe Office in Albania, Etion Parruca – OSCE National Monitoring Officer in Albania, Delina Cici, Coordinator of the “Regional Support for Inclusive Education” Council of Europe Project and Ram Hadroj – OSCE Roma Young Professional. The quality of questions and active involvement of the participants made it clear that young people should be seen as stakeholders of changes happening in their communities and that they are eager and ready to cooperate with international and national institutions. After the first lunch all together, a bit tired, but enthusiastic participants and organizers headed to Durres for the week of learning from each other, sharing experiences and making the first steps of the future networking. The TC_Power of Words_programme of the Training Course was quite tough, but well balanced with energizers, simulation games and outdoor activities. While the first day sessions focused on more general, but very important issues, such as the approaches of the Council of Europe towards human rights education and non-violent communication, the following days were devoted to various aspects of defining and deconstructing hate speech – from the individual level to the community action with the specific focus on the regional realities in Albania and Kosovo. Participants of the Training Course took an active role in the development of the programme. 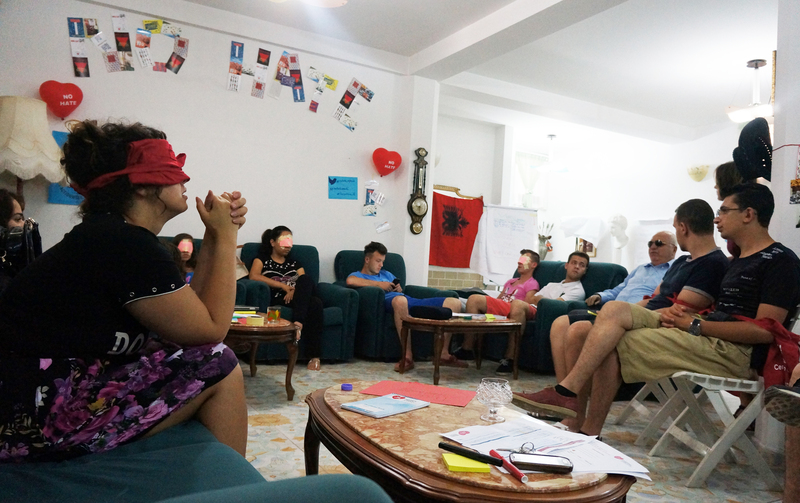 For example, sessions on Roma discrimination in Albania were carried out with an active involvement of the participants – activists from the “Voice of Roma” NGO, while the session about gender-based discrimination and discrimination against LGBT people was accomplished by the Irish EVS volunteers – activists of the “YES!” Campaign in their home country. Indeed, the biggest change comes from personal experience. During the session on discrimination of people with disabilities and visual imparity the participants were offered to be blindfolded while the conversation with the head of Albanian Blind People Association – Sinan Tafaj. Mr. Tafaj was born blind, but it did not prevent him from being a qualified lawyer, professor and a representative of people with disabilities in the Balkans at the international level. Talking about personal experiences, many participants have mentioned role-play games and simulations used during the Training Course among the things that had the biggest impact on their perception of many issues, such as social labeling, freedom of speech, cultural relativism and nationalism. An important topic that was tackled during the training course was youth policies and youth participation in Albania. One of the days, Ms. Jehona Roka, Specialist on Youth Policies from the Albanian Ministry of Social Welfare and Youth, visited us in Durres and in the format of an open discussion presented the main points of the Albanian National Youth Action Plan 2015-2020. Many young people were already acquainted with this policy paper and prepared thorough questions about specific aspects of its implementation. For many participants from different areas of Albania it was their first time in Durres and the City Quest was a fun way to discover the city through the challenge. Each of the four teams had their Quest List with funny tasks around the main sightseeing spots in Durres, such as “Find the place that was like a TV for ancient Romans and make a group selfie there” or “Make a group photo with a heart at Pista”. The winner team got nice prices from the organizers, but the best award was in lots of fun and city discoveries with friends. An important and inevitable part of civil activism is actually the work in the local community. 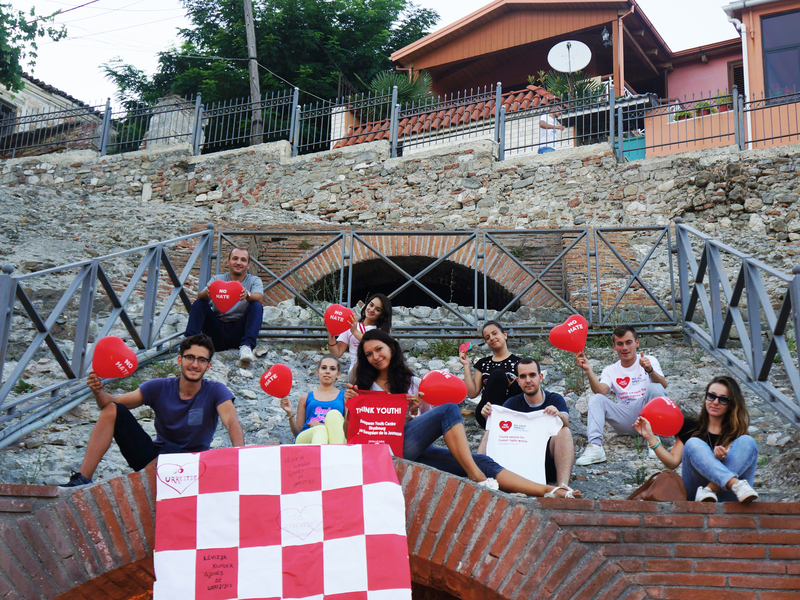 On the last day of the programme, participants developed a City Action against hate speech – they prepared loads of handmade hearts with quotes about love, non-discrimination and understanding and went on the streets with balloons and hand-made installation. As usual, children of Durres enjoyed it at most, but it was great to see their parents smiling and asking more about the No Hate Speech campaign in Albania. For the majority of participants it was their very first experience of a city action and in the end of the day they came up with several ideas, how it could be improved and to what they should pay special attention next time, when they will organize something on their own. It was the first big Training Course of the No Hate Speech Movement in Albania and, following warm feedback from the participants, we can only thank the Youth Department of the Council of Europe for making it possible. Many participants have mentioned that they could never realize before, how dangerous hate speech can be and how much it is spread in our lives. Words have power to heel and to hurt, and it is in our responsibility to use them wisely and to be aware of their impact.